NECKLACE - SARAH COVENTRY. "WILD FLOWER" FROM 1953. 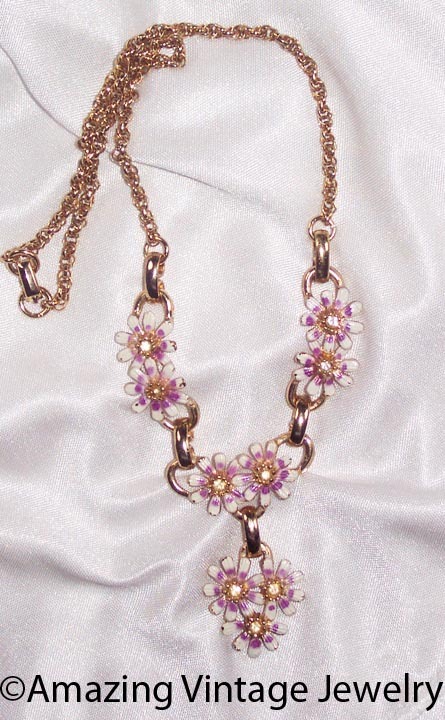 GORGEOUS GOLDTONE FLOWERS WITH WHITE AND PURPLE ENAMEL AND A CENTER RHINESTONE. ABOUT 15" LONG. PENDANT DROP IS ABOUT 1 3/4" LONG. 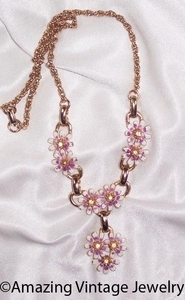 GOOD CONDITION WITH SOME WEAR TO THE GOLDTONE AND SOME WEAR TO THE ENAMEL. PRICED ACCORDINGLY.